The struggle for access to land and against land grabbing is intensifying in various parts of Europe. A major battle is being fought by our members, the SOC-SAT workers’ union, in Andalusia at the “Cerro Liberta” (Liberty Hill) estate in Jaen against BBVA, one of the largest financial multinationals in Europe. And they need our support! Since April 2017, a group of agricultural workers has occupied and put into production a 74-hectare olive grove owned by this bank, which had been abandoned for five years and was used only for speculation and the collection of CAP (European Common Agricultural Policy) subsidies. Jaén, a leading olive oil producer, is one of the regions with the highest unemployment rate, precariousness and social marginalization. Against this backdrop, the enormous concentration of land leaves unemployed rural wage-workers no alternatives. Cerro Libertad is born out of this context and from the recovery by the SOC-SAT of abandoned agricultural land in the process of degradation, turned by them into an agroecological and collaborative project that provides undisputed social, agrarian and environmental benefits. THE LAND IS A RIGHT OF THE PEOPLE, NOT A COMMODITY! PLEASE SEND THESE LETTERS NO LATER THAN MARCH 18, copying to them these addresses: cerrolibertad@gmail.com and info@eurovia.org . 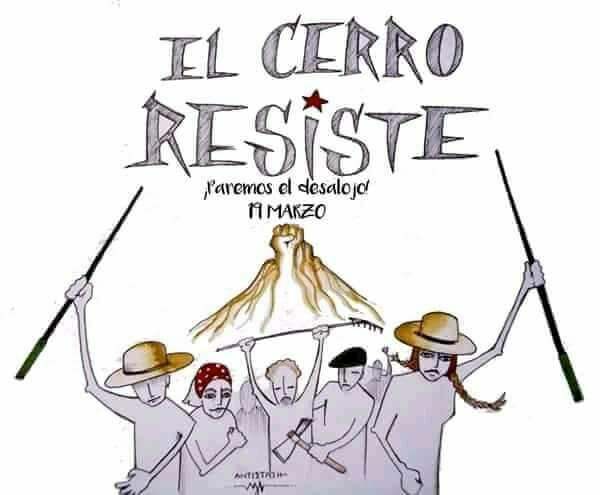 Here you can find more details about the struggles of Cerro Libertad and SOC-SAT .